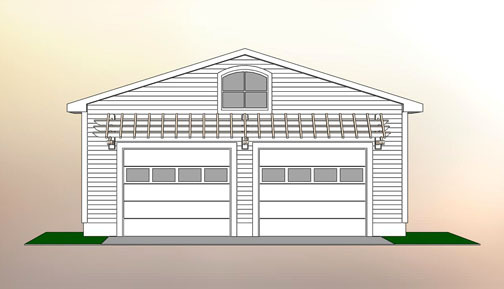 The image above is of a customized garage pergola. 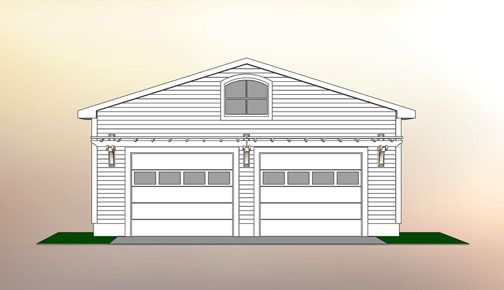 This type of garage pergola is perfectly adapted to long spans occurring over double garage doors. The rafters are suspended from the brackets, which act as beams. 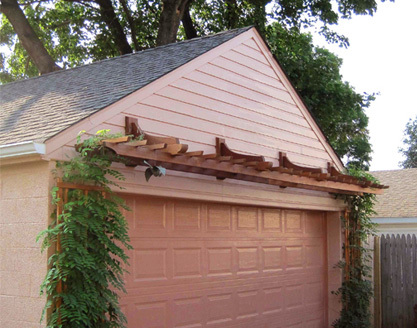 Trellises support vine growth on either side of the garage. 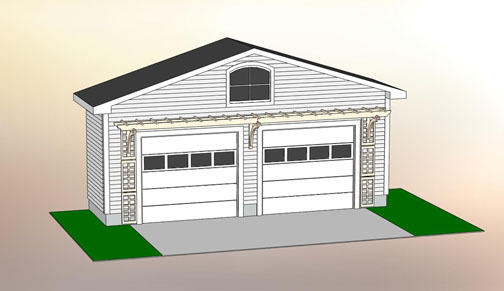 We have designed four styles of garage pergolas that can easily be customized for depth and length. These pergolas can also be used in conjunction with any of our wall trellis grids to aid in growing vines. 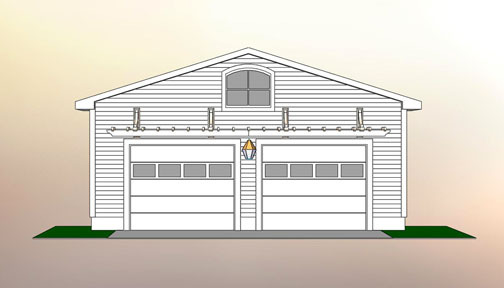 Each of these styles addresses considerations common to garage pergola design such as: length of span, the lack of suitable area for brackets to sit below the structure and the need to create visual interest on a large area of unadorned wall. 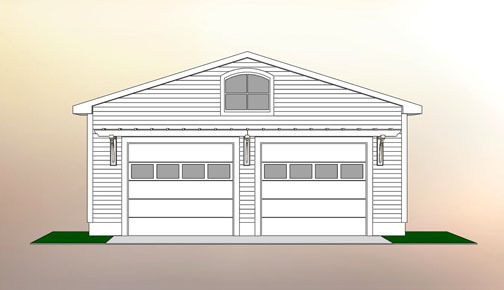 Please call 888-285-4624 with your size and style requirements and we will be able to quote a price for your garage pergola. 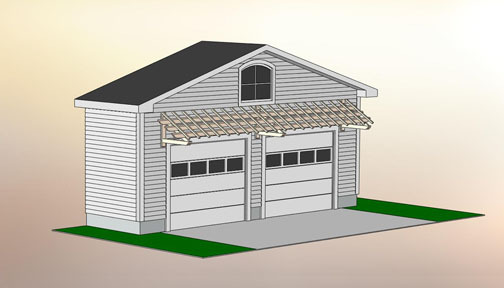 We could also create a custom garage pergola for your individual style requirements. We have worked with clients creating many interesting designs from Victorian brackets for a San Francisco "painted lady" to simple contemporary designs incorporating stainless rods as a support structure. 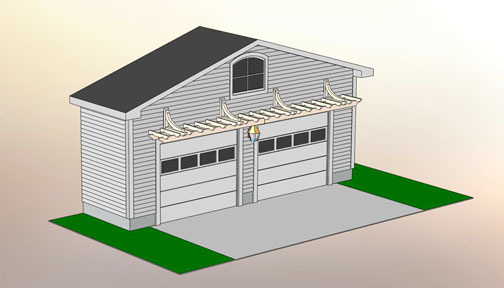 This traditional style pergola, with the brackets supporting the pergola from below, has clean lines and two layers: the purlins sitting directly on the rafters. 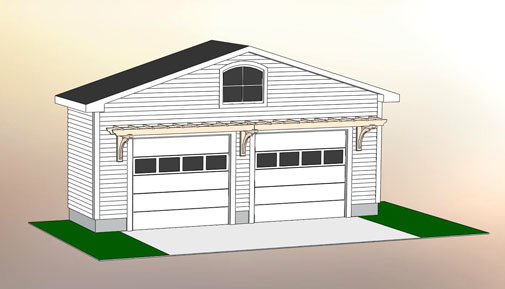 This angled pergola is perfect for larger areas over the garage where a visual fill may be needed. 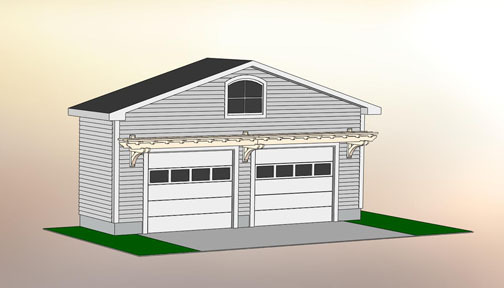 This pergola also works well for larger sized garage openings, 16' or greater. The Manchester Pergola has heavier brackets and three layers: the beams, rafters and purlins creating a strong visual statement.